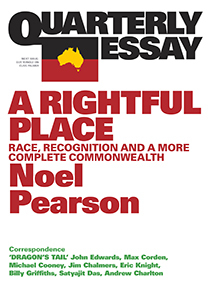 Irish and Irish-identified Australians, or Scots who might have voted ‘Yes’, will be interested to read Noel Pearson’s latest pungent Quarterly Essay for its take on the agonisingly slow process of Indigenous decolonisation. The occasion which prompts the essay is the acknowledged bipartisan need and will to recast the constitution to remove the embedded notion of race within it. In a climate of political intransigence on so many issues, Pearson and his constituency is keen to capitalise on such bipartisanship, and thinks the moment is right, but is also wary of the ways in which the politics of race and battlerdom might undermine good will. Pearson is a man for this political moment. He writes carefully, as a moderate, even styling himself a conservative. But what he means by conservative may in fact be very different from that beliefs held by the conservative parties he most has to reach to secure his agendas. He is keen to match or better the magnificent results of the 1967 referendum for Aboriginal voting rights which secured an unprecedented 90% support from white Australia. By the time he wrote his essay, ‘Tradition, Truth and Tomorrow’, for The Monthly just a year later, Gularrwuy Yunupingu, AM and Australian of the Year, was extremely pessimistic, not to say despairing, about how chronically ineffectively successively Australian governments, even well-meaning ones, had dealt with his people. He details all the prime ministers since Gough Whitlam, placing them on a continuum stretching from disinterest to honest and feeling involvement. None, including the sympathetic, generated the kind of policies or implemented any that ameliorated any of his fears for the future of his people and their way of life. It is perhaps significant that Pearson does not mention Tony Abbott despite his seasonal immersion in Yolngu life during the period of the last Labor governments, and recently as Prime Minister. For Pearson, Yunupingu’s article, for all its angst and despair has become something of a touchstone, ‘an existential prayer’. What Pearson offers, in his longer and often digressive essay for Quarterly Essay, is much more nuanced, far more aware of bi- and multiculturalism, the realpolitik of policy-making and implementation, and, moreover, constitutionally canny. He identifies four sources of grievance: identity as a people, land, language and culture. The problem as he sees it is the maintenance of culture within the nation-state. Though he disclaims being an historian, he writes with an awareness of racialised history and science, and he knows that the constitution of 1901 was written within that current of thinking. He has some very chastening things to say about practitioners on both sides of the History wars, and not just the Far Right, wishing that Blainey and Reynolds had in fact acted more like historians than polemicists (though he defends Reynolds’ core trilogy – The Other Side of the Frontier, Frontier and With the White People). For him, some of the moral-high-ground-holding smacks of moral vanity, and these manoeuvres have in turn reinforced victim pathologies among indigenous people. He praises Bain Attwood’s Telling the Truth about Aboriginal History (2005) as the circuit-breaker. Pearson goes out of his way to make common cause with the present conservative government, and conservatives more generally, not only by styling himself and his concerns as properly and appropriately conservative (in the sense of maintaining Aboriginal cultures). But he also cites the professor of history at Northumbria University, Tom Lawson, to put the blame for an unconscious genocide, on the British. He sees the mechanisms of that process as being the same in terms of outcome: benign paternalism (‘protection’) and destruction on the frontier were complementary processes, both resulting in the destruction of lives, languages and cultures. To lay the blame at the feet of the British does not let colonial governments off the hook, as they too and the nascent commonwealth after 1901 were complicit. Another unexpected aspect of Pearson’s analysis is his high praise for Rupert Murdoch’s The Australian which he sees as the preeminent forum in Australia for taking Indigenous issues seriously. What I have read as hostile and undermining of communities, and as inciting derogation, especially the reporting of sexual violence and drug and alcohol issues, he reads as proper regard for the humanity of the subjects of the reports. He also values the frequent contributions by Aborigines, and sees that publication as the central forum for informed dialogues about Aboriginal issues. There is much in the detail of his argument which is worth attending to. He stresses how small a proportion of the electorate Aborigines are (3%, and spread around the nation) and the effect this has on their chances of being able to affect policy as politicians. Implicitly, it is to defend the fact that much that is done to improve the lot of Aborigines is done by outsiders and without involvement and consent of the communities. Pearson’s ways forward are essentially bicultural: to rethink multiculturalism as a layering of identities; to contest the notion of race (and race-based elements of the outdated Constitution); the freedom to create real jobs on Country and break the dependence on welfare; and to build, strengthen and maintain Aboriginal cultures and languages. He sees amending the constitution as being crucial to these, in particular amending the section 51 (xxvi) which allows the Commonwealth to pass laws for so-called races in Australia. This is an exhilarating essay. Its tone is not hectoring, or despairing, and it toggles confidently and with real feeling between the imperatives of modernity and simultaneously strengthening the oldest living culture in the world. It is a call to take pride in and defend the ‘classical culture of ancient Australia’. Those of us who can take pride in ancient Irish culture and its many transformations and creative adaptations in modernity should be well equipped to understand where he’s coming from. But do we know enough about that ancient culture, and will we equip ourselves to rise to his challenge? 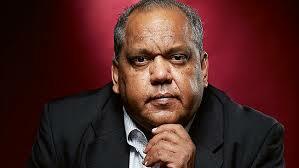 The logic of decolonising has implications for all Australians, especially those who run the show. Frances is one of the editors of Tinteán. She spent many years working with Yanyuwa people in Borroloola on projects to record and disseminate to white Australians their culture. Thanks for finally talking about >Decolonising Indigenous Australia | Tinteán <Liked it!